Perez were, without question, my favourite South African band of all time. Take away that qualifier, “South Africa”, and they would still qualify as one of my favourite bands, full stop. No other band fuelled my desire to enter this world of music as much as Perez did. Point blank, for a long time Perez were – to me at least – South African music. The fact that Mike Goddard, the drummer, had been just a few years ahead of me at my school only engendered more loyalty to them. In fact, all the boys were familiar faces around my hometown of Umhlanga; so it was no surprise that they sustained a near cult-like following. 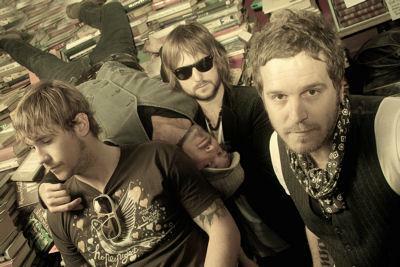 Within 18 months of their debut show they managed to clock up four number 1 singles, and sell out just about every live venue in South Africa – still holding attendance records at some of them. Perez… undoubtedly my favourite SA band ever. I don’t think South African music ever quite got over it. They represented every hope, and every dream we had, of exposing South African rock to an international audience. I remember the exact moment I received the news they were breaking up. It was at a band rehearsal, and we all just looked at each other; it was like we had lost the heart and soul of everything we were trying to do. Fast forward a few years. Perez had played a reunion gig here and there, whenever they found themselves in the same country. I travelled the world, and ended up in Australia. So imagine my surprise when I received word from back home (yes, I still use the term “home”) that Perez were officially (“it’s for real this time, I swear!”) back together… and not only were they jamming, but recording too! It was possibly the best news I had ever heard. Or was it? You see, the problem with Perez is that they now have to live up to the ghosts of their former selves. And, listening to the tracks that they’ve released so far, I’m not 100% sure I’m ready to commit to that; at least, not just yet. Obviously you can’t expect a band to always stay the same. Nor would you want to, anyway. Listening to the same song, over and over again, would be interminably boring, not to mention depressing. So I’m stoked that Perez are taking a brave step in a new direction. After all, not only have they changed, but time has elapsed. We would have changed, too. So it’s a good thing that they’re staying fresh with this new direction. And what a new direction it is, at that. An extreme departure from the majority of their past releases, the new tracks from Perez have them sounding like an updated version of The Beatles (post-India trip with Donovan Leitch, of course… their psychedelic foursome incarnation). And if anyone could pull off something like that, it would be Perez. But I’m in two minds here. While I’m impressed with the new direction, and think that they pull off the style with veritable aplomb – I mean, the songs grow on you exponentially the more you listen to them… which is probably just a sign that it’s scarily new – there’s still something missing here. I don’t know if I’d go so far as to say the heart and soul that used to shine through in their old music doesn’t seem to be there anymore; but that’s the description that keeps coming to mind. And as much as I hate myself for it, there it is. Now, this is all purely based on the tracks that they’ve released thus far, so I’d be the first to admit that all this opinion is based on something that isn’t the finished product. Not by a long shot. And look… to be honest, this is Perez. These guys could release a load of steaming crap, and I’d still be prepared to hang on for their next release, hoping that it conjured back the magic of that first time I heard “Wasted Out”. I would, and that’s the truth. But I just hope that these new releases are made for the love of it all, and not just for the pressure to reform. Because at this stage, I’m not sure which of the two it is. And if it turned out to be the latter, that would ruin a lot of beautiful, beautiful memories. I’m being needlessly hard on them, and I know that. But that’s what happens when you mean something to people. I hope the guys take this in the way that it’s meant. I know they always welcome feedback, so hopefully they will. I’ll still be ordering the CD the very day it’s released, without question. I’m just voicing an opinion, that’s all. Take a listen to the two tracks below, and see what you think. The first is the track “Caught in the Silence”, (with its disquieting, and quite frankly, awesome lyrics), and the second is “If it’s the End” (which shows again how well Matt and Nic’s voice complement each other). If you knew of Perez previously, drop a comment and let me know what you think of their new efforts. It would be nice to hear other people’s opinions. Oh yeah… and more tunes are available on their myspace page , and also on their facebook fan page. Check it out, seriously. Next Post Mr. A to the Z… yes I’m excited.